(Natural News) Merry Christmas from the Health Ranger, and thank God it’s finally okay to say “Merry Christmas” again in America. If your body wasn’t a miraculous self-healing system, you wouldn’t even be alive right now. Consider all the infections you’ve beat, all the injuries you’ve healed and all the times you’ve made it through cuts, scrapes, accidents or close calls. Your body is genetically programmed to function as a self-repairing biological system, meaning you already possess the most astonishing nanotechnology in the cosmos. In fact, it works on autopilot, without you even having to think about it. To “activate” your greatest healing potential, of course, you need the right nutrition, providing your body with the molecular building blocks and valuable elements / minerals it uses to accomplish its tasks. Thankfully, you also live in an era of amazing nutritional abundancewith easy access to the world’s most powerful superfoods, healing herbs and healing foods. All you have to do is be wise enough to avail yourself of those solutions, and your body will do the rest. Despite the fact that we are still living in a medical police state due to mandatory vaccine insanity, forced chemotherapy and other tyrannical interventions carried out essentially at gunpoint, we still enjoy more freedom that almost anyone who has lived before us. The history of human civilization is largely a history of total enslavement, where most people lived as subjects under tyrannical kings. America’s Republic was a radical departure from the chains of tyranny, lifting humanity into a new era of individual liberty and inalienable rights. This freedom continues to bless us all today, which is exactly why this website even exists. That’s also why we must all continue to defend our Republic against attempted left-wing radicalization which is openly trying to overrun America with communism. Cherish the freedom you have… and do everything in your power to defend it at the voting booths during each election. Another joyful improvement to our world comes in the form of the credibility collapse of the legacy media (formerly known as the “mainstream media”). Now, with CNN pumping out hilariously false fake news on a daily basis, no rational person believes anything the network reports. The Washington Post, New York Times, NPR and MSNBC are all now widely recognized as bastions of hilarious fake news ginned up on top of make believe “anonymous sources” that don’t even exist. Only those who live in liberal “bubbles” — who don’t read any real news outside the bubble — still believe those discredited news rags. As nearly all intelligent people have now come to realize, the only real news in our world is the independent media. That’s why so many of the world’s best journalists — such as Glenn Greenwald and Sharyl Atkisson — have gone independent. We’ve also seen the rise of courageous organizations that conduct real journalism investigations, including Wikileaks and Project Veritas. Our own news aggregation website Censored.news is also gaining readership daily (it’s mobile friendly, too). Truly, 2017 was the year the fake news media collapsed. Corporate-run media is, almost by definition, fake media. Although Bitcoin is surely in an insane bubble right now, the good news about the mania surrounding cryptocurrencies in general is that people are voting NO on corrupt central banks and government-issued fiat currency. Even though I’ve warned people not to get into Bitcoin at the moment (because of the mania surrounding its price), I’m simultaneously elated to witness the global rejection of central banks and fake (fiat) currencies issued by bankrupt governments. I’m convinced Bitcoin isn’t the final answer to decentralized currency — it can only handle a few transactions per second, making it useless for widespread commerce — but it blazed the trail for another cryptocurrency that could seriously challenge the global currency hegemony kept in place by central banks and corrupt governments. A new era of “money” may soon be upon us. Cryptocurrencies are going to get faster, more secure and more popular in the years ahead. At some point, they might actually pose a legitimate challenge to the global banking cartels that currently run the world. Everywhere you turn, mainstream science is now finally acknowledging the toxicity of popular food ingredients that I’ve been warning about for over a decade. For example, scientists just recently warned about the brain damaging effects of canola oil, the No. 1 oil used in so-called “natural” foods and groceries. It’s bad for your brain, didn’t you know? The truth is also coming out about heavy metals in foods and supplements (an area where I pioneered lab science research and public awareness), hormone-disrupting chemicals in food packaging plastics, and toxic pharmaceuticals in public water supplies. What people are now coming to recognize is that processed food is often toxic to human biology. Thanks to the effort of President Trump, Congress just passed a tax reform bill that will benefit nearly all Americans by allowing them to keep more of what they earn. While a few wealthy individuals in high-tax states might pay more under the new law, these are the same people who have long argued that it’s a noble act to “contribute” more to the government through high taxes anyway. For nearly everyone else, people will see the creation of more jobs in America as a tidal wave of corporate cash comes flooding back into the USA thanks to the corporate tax rate dropping to just 21 percent. I can’t overstate how big of a deal this is. It means that all those corporations which previously used offshore tax havens and tax jurisdiction strategies to avoid paying the crazy high tax rates in America will now keep their profits in America, pay the 21%, and invest the rest in expansion and growth. Just five years ago, tech giants were universally worshipped by nearly everyone. Now, at least half the country knows that Google, Facebook, YouTube and Twitter are all extensions of the deep state that spy on users and selectively oppress voices of truth that challenge the status quo. Now that the public is awake and aware of the extreme evils of these tech giants, we will witness a rapid transition to alternative services and an increase in people who don’t trust anything the tech giants tell them. Thank God that America still has enough free market economics and patriots to crush the attempted efforts of radical left-wing nut jobs who are trying to turn America into a communist state. 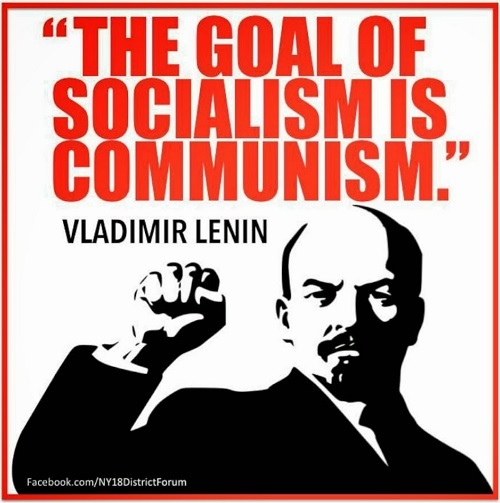 Socialism and communism always leads to extreme poverty and, eventually, genocide or mass murder. Look at the legacy of communism over the last 150 years and you’ll see a trail of murder, bloodshed and human suffering. America, however, is a land of patriots, where free market defenders and armed citizens simply will not tolerate the rise of radical left-wing socialism or communism. Thank God we live in a nation where armed patriots will defend America with whatever it takes to make sure communism never takes hold in our land. Thanks to the efforts of the Trump administration, the deep state is finally being exposed in America. Swamp creatures like James Comey, Robert Mueller, Peter Strzok and Andrew McCabe are being outed or fired. Barack Obama’s complicity with Hezbollah terrorists has already been exposed, and large-scale investigations are under way that will no doubt send many swamp creatures to jail in 2018. The Uranium One investigation is being reopened, and the top political mafia boss herself — Hillary Clinton — may actually, for once in her life, face real justice. Two websites worth visiting for coverage of the deep state include TheGatewayPundit.comand DeepState.news. A new “lab verified” certification program for food and supplement products, launching in Q1, 2018. An expanded organic food manufacturing and fulfillment facility, opening in February (greatly expanding our manufacturing capacity). The acquisition of new laboratory instrumentation for greatly improved throughput on pesticide extraction and detection. The release of our Biosludged documentary (wrapping up for release in 2018). The launch of a new, enhanced video news studio to launch a video news channel (now scheduled for 2019 launch). The large expansion of our academic science research team, which is now monitoring over 1,300 academic and scientific news sources to bring you breaking news each day. There’s much more coming in 2018 and beyond. I promise you we are going to continue to fight for liberty, food transparency, medical freedom and REAL science in the new year. 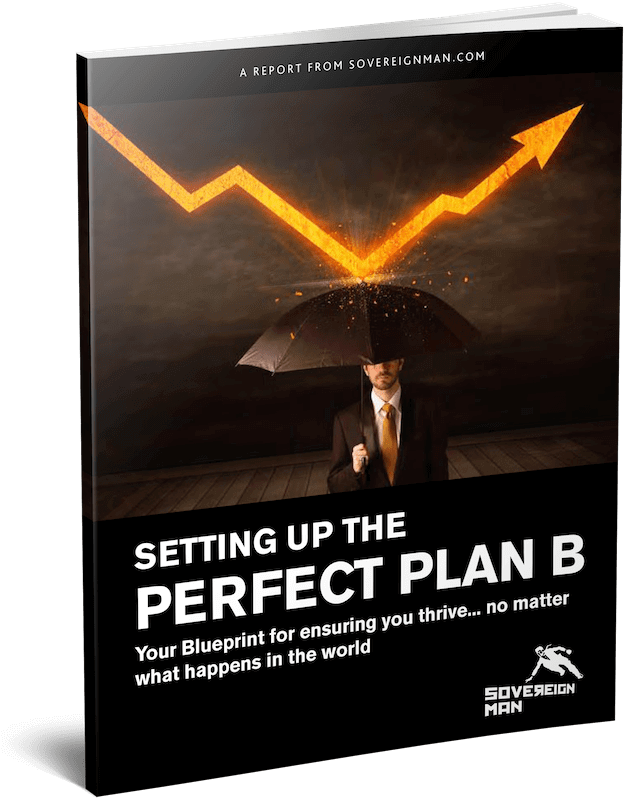 We’re also going to work hard to make sure you’re fully prepared for the chaos that’s coming (read Bugout.news) while helping you reduce your risk exposure to financial vehicles that look especially risky (like Bitcoin or bonds, for example). We couldn’t do this without your support, so thank you for all that you’ve done for us in 2017. We’re counting on your support for 2018 as well, and we will use every resource within our reach to pursue the mission you see outlined here. We stand for health freedom, food freedom, medical freedom and human freedom. We will fight for your right to say “NO!” to toxic vaccines, deadly chemotherapy and forced euthanasia (coming soon in California), and we will sound the alarm on pesticide contaminants or heavy metals in foods, herbs and dietary supplements. There’s a lot more coming from this website in 2018, so stay tuned. We are the new media, and we’re just getting ramped up! In previous documents, interviews, and other now-public materials, the NSA has stated that, while they can collect data from nearly anyone, they only target a small number of people who could be engaged in suspicious activity. Exactly what constitutes suspicious activity has never been very clear, but it’s safe to assume that anyone trying to get in touch with a terrorist organization, buy drugs online, or be in another way clearly intending to break the law, would be a target. It’s reasonable to assume that VPNs, encryption software, and other security-related apps and services will also earn you a spot on the surveillance list. If this is the case, it seems likely that a huge number of MakeUseOf readers are already being monitored, and many more will be on the list before long. How Do We Know About XKeyscore? Hearing something like this might make you wonder about the source of the information that has a lot of security experts riled up. The XKeyscore program was first detailed in Edward Snowden’s revelations, and has been profiled a number of times since then (here’s a good overview of XKeyscore from The Guardian). In short, it’s a system that allows NSA employees to search a massive database of collected information, including e-mail, and allows for the monitoring of real data, not just meta-data. The XKeyscore code that’s making waves at the moment was first published in a German publication called Taggeschau, though they declined to state where the information came from. There was nothing to indicate that the code came from documents released last year by Snowden, leading a number of leading privacy and security experts to speculate that there is now a second NSA leaker. After the XKeyscore code was released, it was analyzed by a number of experts and some of the results were published in Taggeschau in a review by Jacob Applebaum, John Goetz, Lena Kampf, and others. Since this publication, other experts have weighed in. Errata Security posted an interesting review of the code, stating that it might not be real code at all—that it could have been compiled from snippets of older code, or possibly from a training manual. So everything has to be taken with a grain of salt at the moment. In short, it means that you’re probably on an NSA targeted surveillance list, especially if you’re a regular reader of MakeUseOf or if you’ve run searches for privacy-related tools or articles. And while this doesn’t mean that your phones are tapped or that there’s a black van sitting outside your house, it’s very concerning from a privacy point of view. Although searching for privacy tools will likely get you added to an NSA list, we still recommend using them, even if you have nothing to hide. Just because you get put on a list for searching for Tor doesn’t mean that the NSA can see what you’re up to while you’re using it. And even if you’re on the TAILS list, it’s still a great secure operating system. And don’t forget to check out all of the tips presented by our Security Matters section: encrypt your e-mails with PGP, encrypt your Facebook chats, learn the essentials of smartphone security, and more. The Fastest VPNs of 2018! To help you stay secure and anonymous online, we’ve tested more than 50 VPNs, and these have the best speed scores. Security is too often thought of as a zero-sum game. You either make the effort to protect yourself and lose out on performance and shiny new toys, or you choose faster connections and an easier life with the understanding that you may end up making making ransomware payments or having your identity stolen. We argue that this mindset is long out of date, especially in the world of virtual private networks,or VPNs. These services protect your data within an encrypted tunnel, keeping bad guys, ISPs, and snooping spies at bay. Using such a service will certainly have an impact on your internet connection, but the good news is that it needn’t be a big one. Using a VPN tends to slow down internet connections simply because it adds more steps to the process of transferring data over the web. When you browse without a VPN, your web browser sends a request through your local network, out onto the public internet, and to a web server that responds with the requested information. This is what happens every time you click a link or enter a URL. It’s how the internet works. But you still need a VPN. Why? We’ll explain. When you activate a VPN, your web traffic is routed through an encrypted tunnel. It travels through this secret tunnel to a server operated by the VPN company. It then exits its encrypted tunnel and enters the public internet. The Nutcracker is one of my perennial favorites, thanks for sharing the joy and spirited festivities. Happy holidays and wonderful New Year! 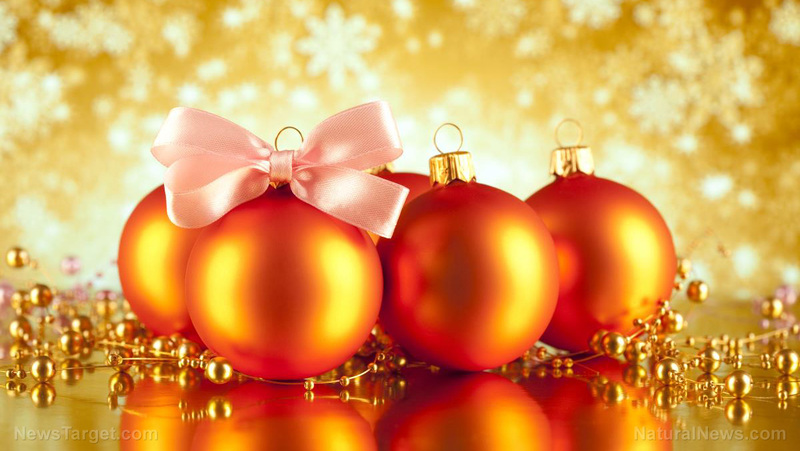 HAPPY HOLIDAYS & Merry Christmas to FuturisTrendcast Readers from Lada Ray! Just to clear up any confusion… This is not Chopin – Spring Waltz. Such piece does not exist! This piece is originally written by Paul de Senneville and performed by Richard Clayderman. The piece was rearranged by pianist George Davidson and it is his version I perform here. This version is also incorrectly known as “Chopin’s Spring Waltz”. I believe this is caused by a popular, but wrong titled, video here on youtube. 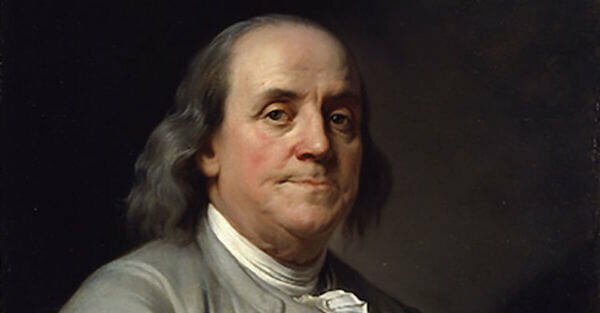 On September 17, 1787 on the final day of the Constitutional Convention in Philadelphia, Benjamin Franklin was approached by a woman as he walked out of Independence Hall. “Well Doctor, what have we got– a republic, or a monarchy?” she asked. It was a burning question on everyone’s mind: what form of government would the Constitutional delegates establish for the new country? The Constitutional Convention had just ended, and it had been a bitter four months as the delegates fought and argued over every single word in the draft. Factions had developed. Some delegates wanted a federal government with absolute power. Others wanted fewer guaranteed liberties for individuals. Franklin knew that the representative government he had worked so hard to establish was incredibly fragile, and that it could easily slip away. It was the same fight two years later when the 1st United States Congress fought over whether or not to establish a Bill of Rights. Once again, after months of bitter arguments, Congress finally reached a compromise in September 1789, approving ten Constitutional amendments that guaranteed certain freedoms for the people. More than two centuries later it’s clear that most of what they worked to achieve has completely changed. The First Amendment, which ensures that Congress can make no law restricting freedom of speech, press, religion, and peaceable assembly, has become almost a punch line. Ironically the greatest assault on Free Speech today doesn’t even come from government, but from university students who protest against any ideas they find offensive. Violence on university campuses is now common as students come out of their Safe Spaces to physically obstruct and violently impede controversial speakers. Any statement that doesn’t conform to their very narrow agenda is now considered hate speech. And it’s the students themselves who want any sign of dissent banned, and more mandatory indoctrination of their newspeak ideology. This one seems to be under fire on a regular basis, with mainstream media from Rolling Stone to Vanity Fair calling for its outright repeal. The Third Amendment guarantees that no soldier shall be quartered in any home without the consent of the owner. This seems almost a quaint, obsolete historical reference at this point given that the US military hasn’t had to be housed among the civilian population… ever. So, OK, great. The Third Amendment is still in-tact. Forget it. The federal government spends tens of billions of dollars each year to illegally spy on EVERYONE, including Americans and American allies. This one is a total joke. The Fifth Amendment is a big one. It ensures that no one can be held to answer for a crime, including a felony, without grand jury indictment. This protection died a few years ago when Barack Obama signed the National Defense Authorization Act for Fiscal Year 2012, which authorized the military detention of US citizens on US soil, no due process required. The Fifth Amendment also famously protects against self-incrimination, ensuring that an individual cannot be called as a witness against himself. This provision is also gone, considering that legal precedent now exists for police to force you to give up your mobile phone or computer password. This is now a complete farce given the widespread use of top-secret FISA courts, military detention facilities, and drone-strike assassinations. The Seventh Amendment guarantees the right to a jury trial if there’s a dispute over property that exceeds $20. But considering that the government has stolen billions of dollars worth property from Americans through Civil Asset Forfeiture in recent years, all without a trial, it seems the Seventh Amendment isn’t worth the paper it’s printed on. I thought about this one the other day when I was walking through the terminal at DFW International Airport. 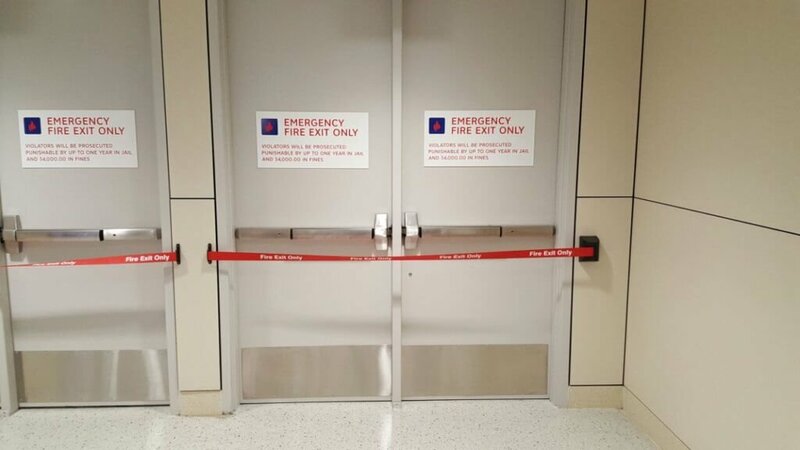 A sign caught my eye that as prominent displayed on an emergency exit door, warning passers-by that opening the door was a violation of the law and subject to up to one year in prison. I was dumbfounded. A year in prison for opening a door? People go to jail and do hard time for smoking certain plants (but not others), failing to file tax forms, and a number of completely obscure and innocuous crimes. There were four federal crimes when the Constitution was ratified. Today there are thousands. On any given day you and I probably commit several of them without even knowing. And each comes with absolutely insane penalties. The reality is that you cannot even apply for a passport anymore in the Land of the Free without being threatened with fines and imprisonment. 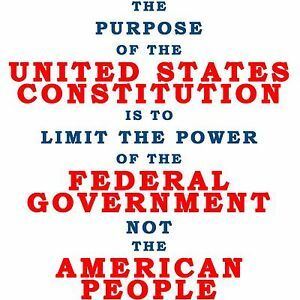 Last were the Ninth and Tenth Amendments, which were supposed to limit the power of the federal government in favor of the states and the people. Those went out the window a LONG time ago, especially after 9/11. Look, don’t get me wrong: I’m not suggesting that America is some vicious, brutal dictatorship. It’s not. But anyone who has the courage to be honest and objective can see the obvious decay. Benjamin Franklin’s warning is coming true. And the trend is accelerating. The North Korean hacking group has turned greedy. Security researchers have uncovered a new widespread malware campaign targeting cryptocurrency users, believed to be originated from Lazarus Group, a state-sponsored hacking group linked to the North Korean government. Active since 2009, Lazarus Group has been attributed to many high profile attacks, including Sony Pictures Hack, $81 million heists from the Bangladesh Bank, and the latest — WannaCry. The United States has officially blamed North Korea for global WannaCry ransomware attack that infected hundreds of thousands of computers across more than 150 countries earlier this year. In separate news, security experts have blamed Lazarus group for stealing bitcoins worth millions from the South Korean exchange Youbit, forcing it to shut down and file for bankruptcy after losing 17% of its assets. Researchers from security firm Proofpoint have published a new report, revealing a connection between Lazarus Group and a number of multistage cyber attacks against cryptocurrency users and point-of-sale systems. After analyzing a large number of spear phishing emails with different attack vectors from multiple spear phishing campaigns, researchers discovered a new PowerShell-based reconnaissance implant from Lazarus Group arsenal, dubbed PowerRatankba. Encryption, obfuscation, functionality, decoys, and command-and-control servers used by PowerRatankba closely resembles the original Ratankba implant developed by Lazarus Group. PowerRatankba, with at least two variants in the wild, acts as a first-stage malware that delivers a fully-featured backdoor (in this case, Gh0st RAT) only to those targeted companies, organizations, and individuals that have interest in cryptocurrency. “During our research, we discovered that long-term sandboxing detonations of PowerRatankba not running cryptocurrency related applications were never infected with a Stage2 implant. This may indicate that the PowerRatankba operator(s) were only interested in infecting device owners with an obvious interest in various cryptocurrencies,” reads the 38-page-long report [PDF] published by Proofpoint. Once installed, Gh0st RAT allows cybercriminals to steal credentials for cryptocurrency wallets and exchanges. It’s notable that PowerRatankba and Gh0st RAT don’t exploit any zero-day vulnerability; instead, Lazarus Group relies on mixed programming practices, like C&C communication over HTTP, use of Spritz encryption algorithm and the Base64-encoded custom encryptor. Besides stealing cryptocurrencies, the group was also found infecting SoftCamp point-of-sale (POS) terminals, largely deployed in South Korea, using RatankbaPOS malware for stealing credit card data. Since RatankbaPOS was sharing same C&C server as the PowerRatankba implant, it is believed that both the implants are linked to Lazarus Group. The explosive growth in cryptocurrency values has motivated not only traders but also hackers to invest all their time and resources in making digital wealth. 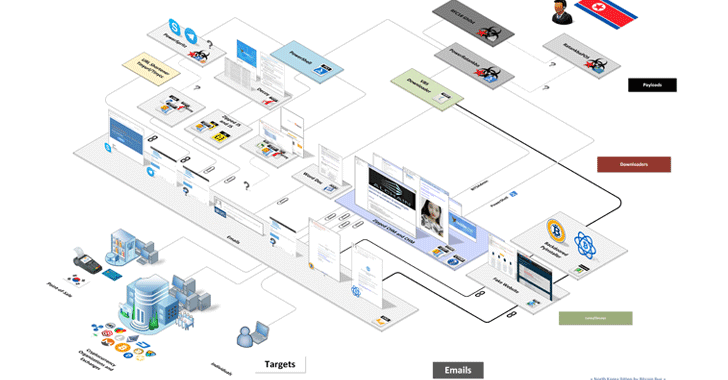 More details about the new malware campaigns run by Lazarus Group can be found in the in-depth report [PDF], titled “North Korea Bitten by Bitcoin Bug—Financially motivated campaigns reveal a new dimension of the Lazarus Group,” published by PowerPoint on Wednesday.